LAST CHANCE to join #yapceu2016 & purchase your conference, training course, Turda Salt Mine, or partner's program tickets! Go to http://act.yapc.eu/ye2016/ & take a tour! You gotta get'em all! These being said, can't wait to see you all in Cluj-Napoca! 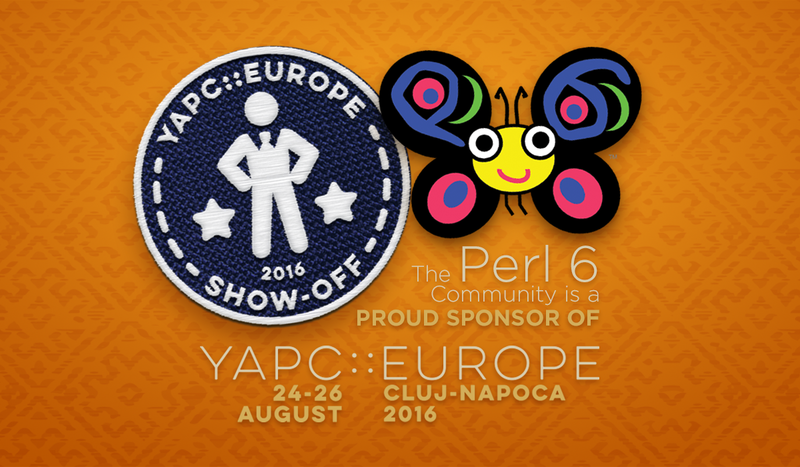 the organizing team of YAPC::EU 2016 need your help for a nice project they want to implement during the three days when Cluj will become the capital city of Perl. So, dear community, please search your photo archives && upload the photos you believe to be appropriate to this shared folder we prepared, as it allows file submissions even if you're not Dropbox users. Many, many thanks for helping out! We're pleased to announce that the pre-conference party details have been confirmed. We're going to have a nice ‪#‎rooftop party, hosted by Evozon, on their premises. If you're making travel plans, don't forget to mark the address: 62, Moților street, Cluj Napoca. We want to thank our amazing sponsors, for making our plans a reality. Food's on Eligo Recruitment Ltd, drinks are on Evozon, you just make sure to bring the good mood! Can't wait to meet you all! 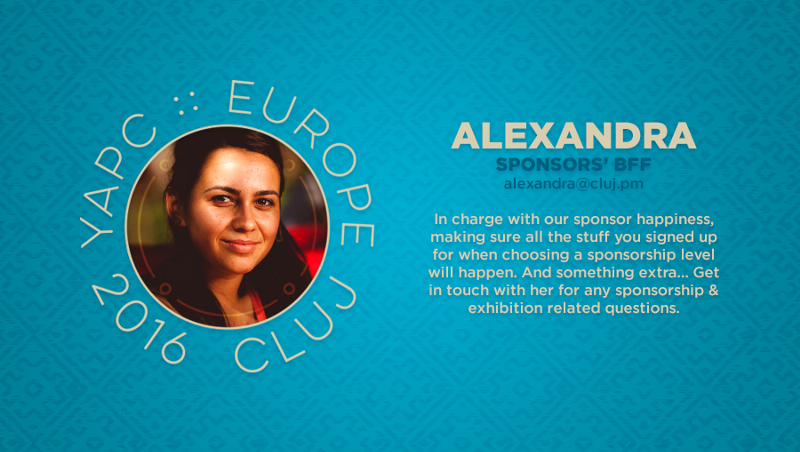 We're incredibly happy to announce a new YAPC::Europe 2016 supporter. The latest Community Partner is none other than O'Reilly. O’Reilly Media is an internationally recognized, multi-faceted media company that has played a seminal role in the Internet revolution. Through its books, events, online training courses, webcasts, and evangelism, O’Reilly has educated a generation of technologists and entrepreneurs and shaped the dialogue about the future direction of the industry. The company has played an enormous role in the evolution and adoption of the World Wide Web, open source software, big data, and the Maker movement. Explore the O'Reilly Universe. As part of their support && involvement in making YAPC::Europe 2016 awesome, they've decided to give away a free ebook to all YAPC::EU attendees. How cool is that? So just come to YAPC, and you'll get your link to download a free ebook in the conference kit. 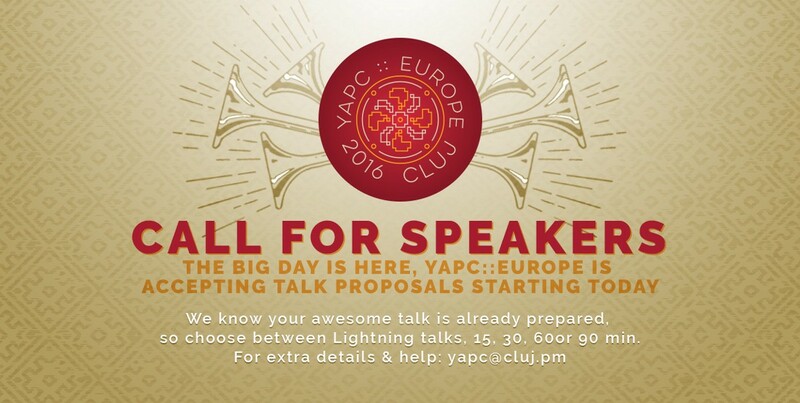 Even if the call for speakers ended, you can still get your 5 minutes of fame on the YAPC::Europe 2016 stage! The YAPC (Yet Another Perl Conference) 19100 Conference came up with the term “lightning talk” at Carnegie Mellon University in Pittsburgh. The term was first coined by Mark Jason Dominus in June 2000. The practice of lightning talks was first known to be used at the Python Conference in 1997, but was not named until the YAPC 19100 Conference. As you might've found out by now, the Call for Speakers for the upcoming event closed July 15th! 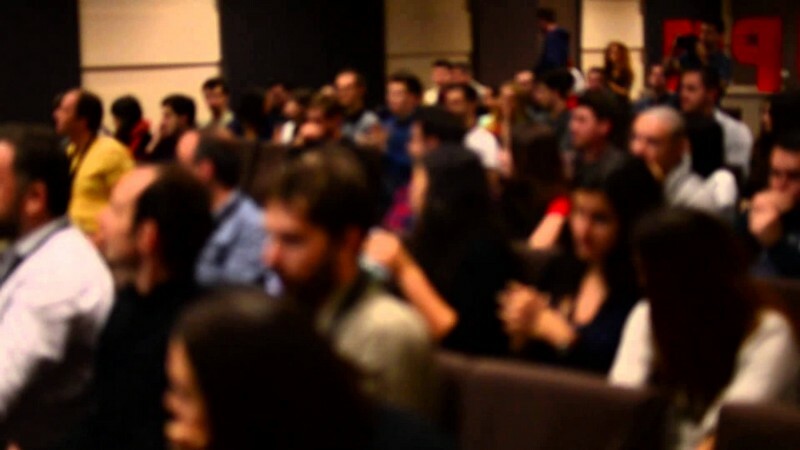 The last batch if approved talks to be announced soon ‪#‎yapceu2016‬. Keep an eye on the event announcements, schedule's gonna be published by end of July. And don't forget to register for the event at http://act.yapc.eu/ye2016 See you! The lucky winners are :Anastasiya, Mihai, Sergiu, Diana S., Diana D. Cristina, Alexandra, Andra, Sorin, Anda , Rebeca, Istvan, Alina, Dan, Gheorghe, Alexandra, Liviu, Eduard, && Diana P.
Your ticket will be sent to you by email, alongside all registration && conference instructions! Can't wait to see you all at YAPC::Europe 2016! "The Linux enthusiasts are, however, a diffused community, and most of their contributions to open source remain unknown. Some of the work is posted on GitHub, and has been gathered by Ionica Bizau, the Romanian with the highest rank on the repository hosting service. The Linux guys meet at events such as Make Open Source Software or the annual Perl Conference YAPC::Europe, which will take place in Cluj-Napoca this summer. Next in line is, however, an informal weekend in Bran, where Dracula’s castle is located, scheduled between the 15th and 17th of July. There, they’ll grab a pint and talk about how Linux can make a stronger statement in Romania." So who's the latest Partner Hotel? It's none other than Opera Plaza, the very first 5* hotel in the region of Transylvania. Set in the historical centre of Cluj-Napoca, only 200 m from the Romanian Opera and 900 m from Unirii Square, Hotel Opera Plaza features free WiFi and 2 restaurants serving Romanian and international specialties complemented by a wide selection of wines. We are really excited to have them on board, so if you're looking for a posh location, you should definitely consider this one. Check out YAPC:::Europe Special Rates on the wiki. Monday comes with great news: Dave sent us more details on his Modern web Development with ‪#‎Perl‬ & ‪#‎Dancer‬ training course. Check out all the details on the YAPC::EU Website && see if it's suitable for you. If this is the training you've been looking for, you should definitely join Dave Cross on August 23rd & learn Perl in a fun & casual environment! 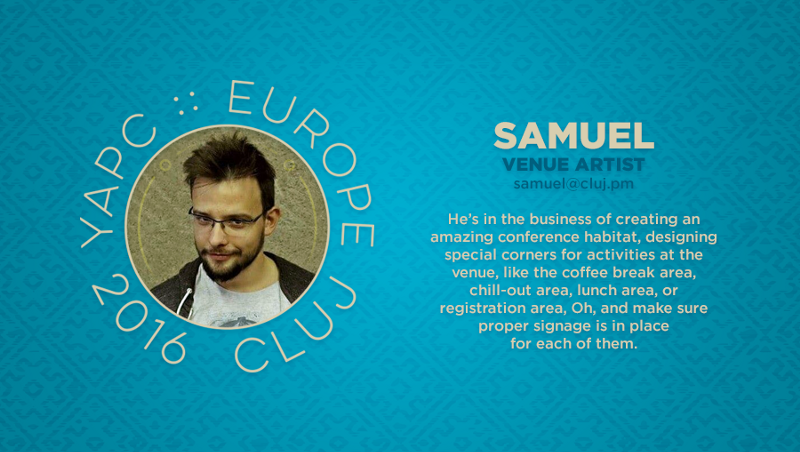 The venue we chose for these activities is an informal one: Cluj Hub. We love it, you will sure love it, too! Also, feel free to check out the other training courses available at the conference: Perl 6 by Jeffrey Goff && Public Speaking by Liana Precup. For more details && ability to sign up for either day, or all three, please go to the dedicated wiki page. Another happy friday for the YAPC::EU team. 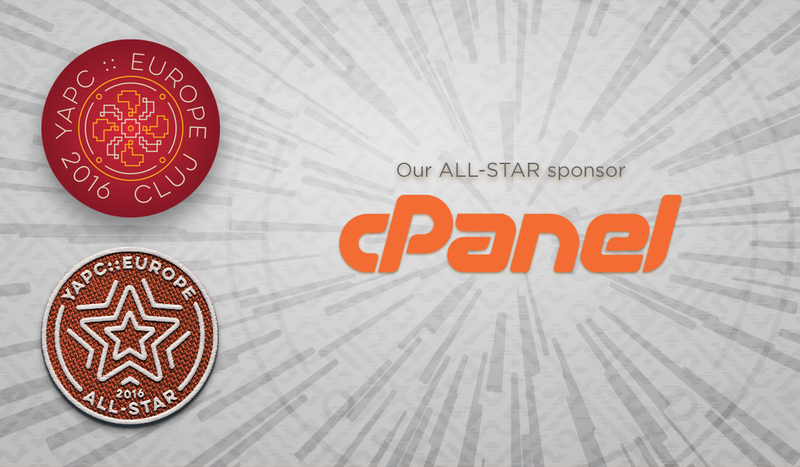 We’re incredibly excited to announce our newest sponsor, cPanel, the very first #AllStar partners of the European Perl Conference. Since 1996, cPanel, Inc. has been delivering the web hosting industry’s most reliable, intuitive control panel. The robust automation software helps businesses thrive and allows them to focus on more important things. Customers and partners receive first-class support and a rich feature set, making cPanel & WHM the hosting platform of choice. For more information, visit https://cpanel.com . You’re going to meet them in Cluj this summer, so you’ll be able to ask them all about their business and, of course, thank them for their contribution to the event. If you’d like to contribute to the future development of Perl && Perl dedicated events, you can become a sponsor yourself. Check out the various options here. The conference party will have a royal touch, as the venue is none other than the courtyard of ‪#‎Banffy‬ palace, located at the very heart of Cluj-Napoca, in its most central spot, Piata Unirii! Also, as part of attending #yapceu2016, entrance to the museum for both participants && plus ones will be complimentary, provided you show your badge to ticketing staff. Thank you Muzeul de Arta Cluj-Napoca! If you’re booking at the following hotels, you should know we teamed up with them && they’re going to provide better rates to YAPC::Europe 2016 attendees. Keep in mind: Discounts apply to rates displayed at front desk. To get the discount, please mention you are attending YAPC::Europe 2016. Rule applies to phone, e-mail, or reservation form booking. 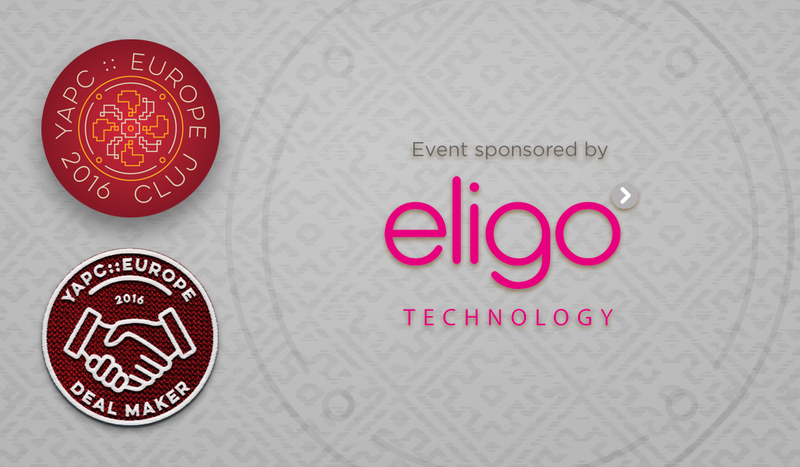 Immense honor to introduce our latest ‪#‎DealMakers‬: Eligo Recruitment Ltd. These lovely chaps are also sponsoring the pre-conference event food. 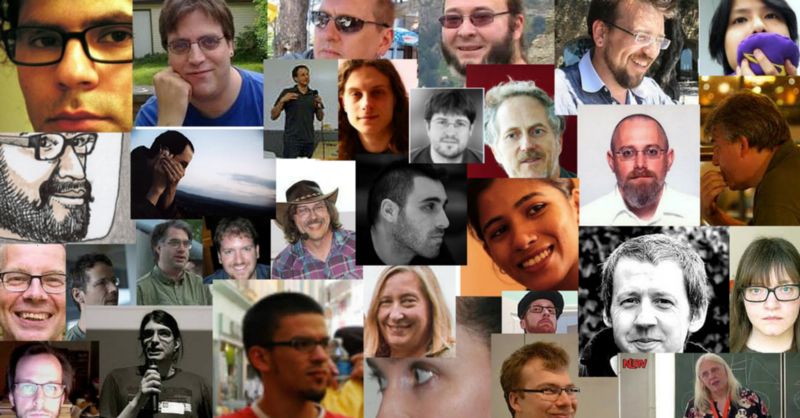 Huge thanks for contributing towards making ‪#‎yapceu2016‬ possible & growing the ‪#‎perl‬ ecosystem! Don't forget to drop by their famous pink stand. Thanks Eligo, keep making awesome deals! 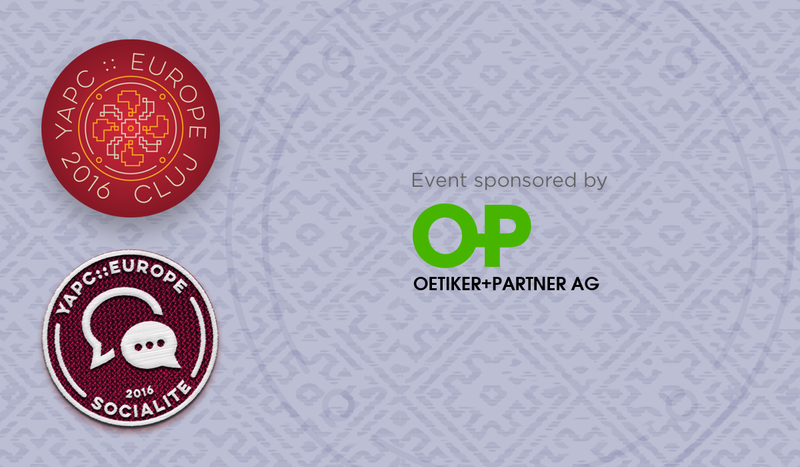 Happy Friday is happy: new sponsor joins the list of ‪#‎Socialites‬, OETIKER+PARTNER AG. Huge thanks for contributing towards making‪ #‎yapceu2016‬ possible & growing the ‪Perl ecosystem! 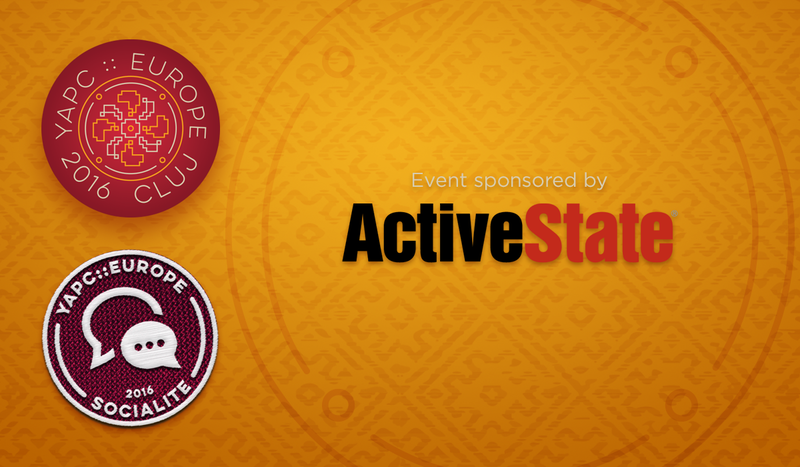 Meet our latest sponsors, the lovely folks at Active State Thanks for your support in making YAPC::EU 2016 possible! Founded in 1997, ActiveState is a global leader providing software application development and management solutions. Among the company’s products we can find ActivePerl, commercial-grade Perl distribution used by millions of developers around the world for easy Perl installation and quality-assured code. Whether you’re using Perl for mission-critical applications or open source projects, ActivePerl offers worry-free implementation and significant time savings over open source Perl for installing and managing common Perl modules. ActivePerl comes precompiled for out-of-the-box installation and includes core Perl, popular modules, the Perl Package Manager (PPM) and complete documentation. Huge thanks for joining us! If you’d like to contribute to the future development of Perl && Perl dedicated events, you can become a sponsor yourself. Check out the various options here. Happy to announce another amazing company joining the list of YAPC::EU 2016 Supporters, as Deal Makers. Let’s welcome Perl Careers & thank them for all the great work they’re doing for the community. Third ‪#‎yapceu2016‬ training will be revealing ‪#‎perl6‬ to all those interested in its amazing features. Brought to you by Jeffrey Goff (drforr) on August 23rd 2016, at Cluj Hub! The course offers an introduction to Perl 6, a powerful new language combining the pedigree of Perl 5 with a brand new metaprogramming system, built-in concurrency, and software-definable grammars, among many other features. And if you're not a speaker, several options are available. You can purchase either student tickets (if you are still in Uni, of course), Regular Tickets, First Timer Tickets (if you've never been to a YAPC::EU before), or Corporate Tickets. Did you purchase yours yet? Join us for a great conference in the heart of Transylvania! 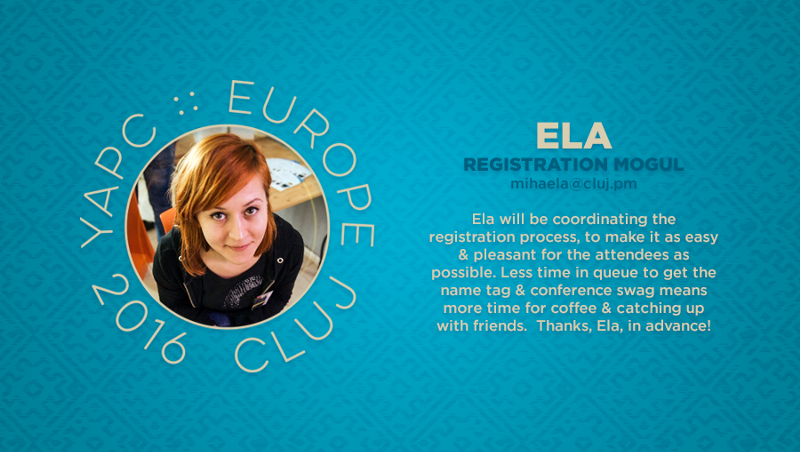 Happy to announce a new training at ‪#‎yapceu2016‬. 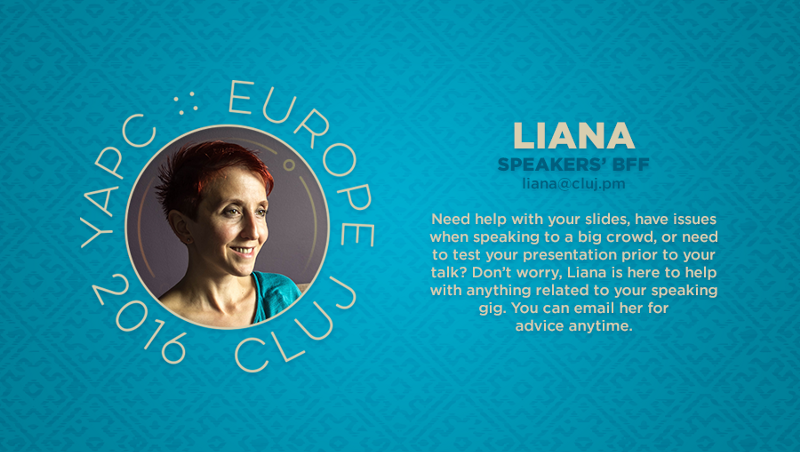 Our ‪#‎SpeakersBFF‬, Liana, will host a ‪‎Public Speaking‬ workshop for‪ ‎speakers‬ who think they could benefit from such a presentation. She's an extremly open & enthusiastic person, so don't be afraid to approach her for any specific Public Speaking advice. It will be a 3-hour course (brief intro + workshop), hosted at Cluj Hub on August 23rd, which will help with preparing your talk & maybe get rid of stage fright. Did we mention it is completely FREE of charge? Another batch of awesome talk’s been accepted! Time to celebrate! Check out http://act.yapc.eu/ye2016/talks & hit that attend button ‪#‎yapceu2016‬ oh, the ‪#‎excitement‬ There are lots of interesting topics. it will be hard to choose which talk to attend. The remaining talks to be reviewed soon, don’t panic! Shout out to all the brave folks who submitted so far! You rock! Can't wait to see you all up on the YAPC::Europe 2016 stage. The designer didn’t agree with Amalia’s original role & description:‪ #‎troublemaker‬, only here for the food && changed it. So meet our ‪#‎yapceu2016‬ master ‪#‎organizer‬! 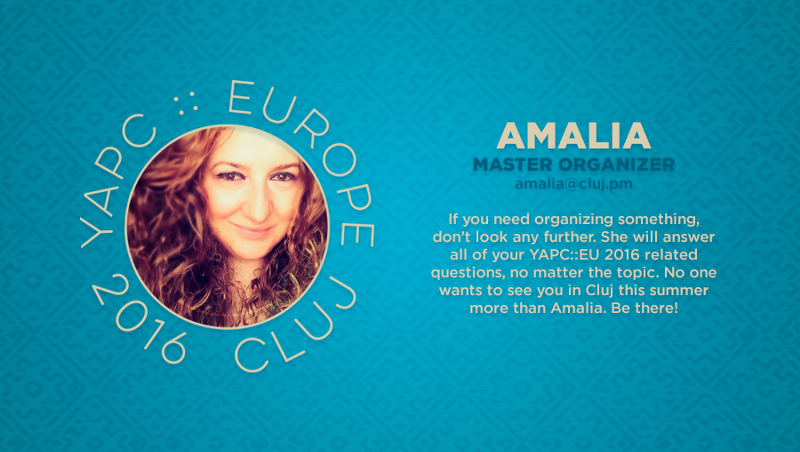 Bur he kept the really important part: no one wants to see you in Cluj this summer more than Amalia. Be there! No website would see the web without a team of dedicated developers & designers! :D We're sure you all agree. 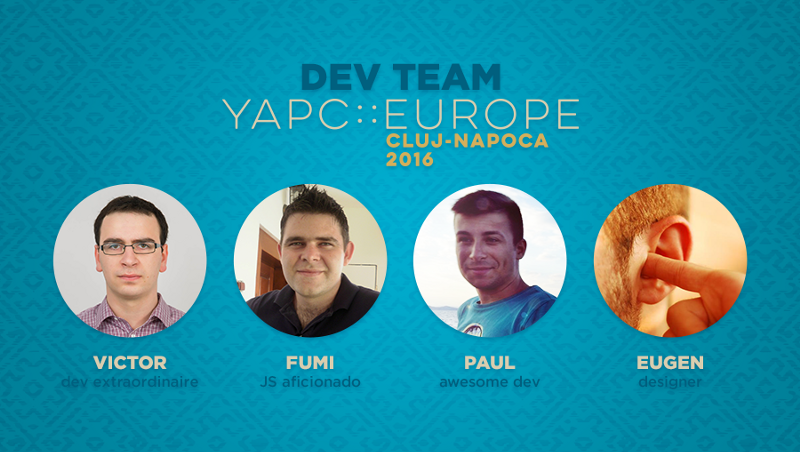 Meet the brains behind the ‪#‎yapceu2016‬ website: Victor, Fumi, Paul, our great developers && Eugen, our favorite designer! We are incredibly proud of them. Website keeps looking better && better. 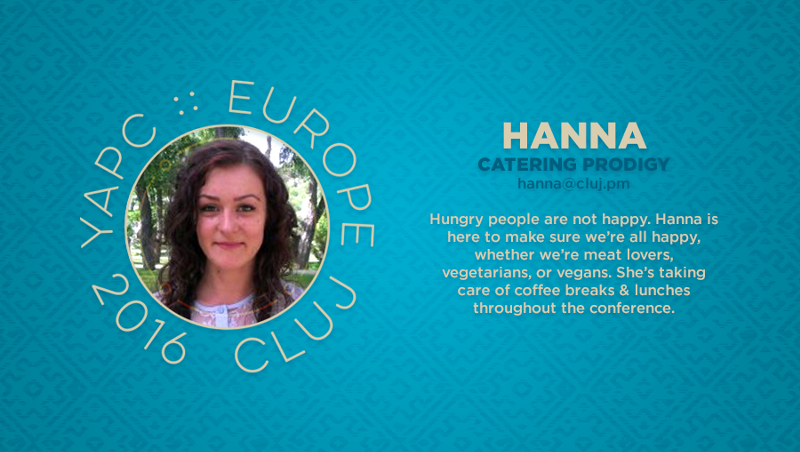 Hanna will make sure we have all sorts of options available: for ‪‎meat‬ lovers, ‪‎vegans‬, or ‪vegetarians‬ && nobody stays hungry! We’re super excited to announce our first Rockstar Sponsors. 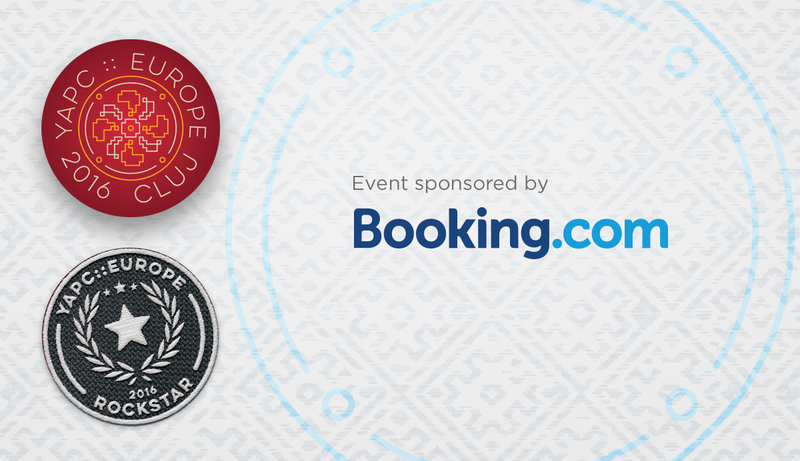 All, let’s welcome Booking.com to the growing list of YAPC::Europe Supporters. Booking.com, part of the Priceline Group (Nasdaq: PCLN), is the world leader in booking accommodations online. Each day, over 1,000,000 room nights are reserved on Booking.com. Booking.com is an international success that build their website on Perl. 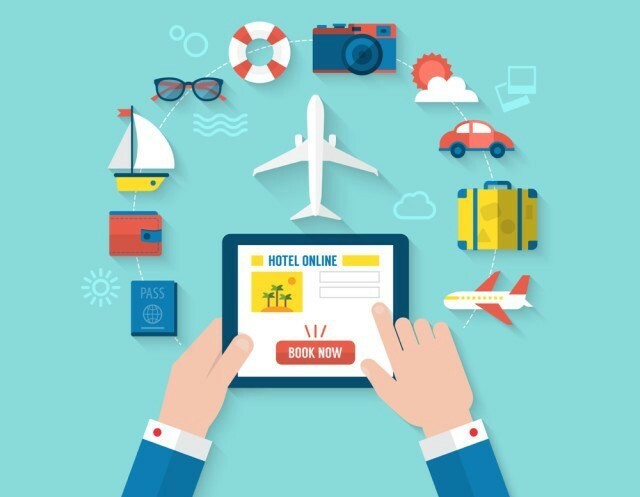 Booking.com runs one of the world’s largest Perl-powered websites and they offer a rapidly evolving and dynamic environment. Their technology is focused on development, scaling and automation. Booking.com constantly challenge their current environment to see how they can improve their business and go beyond current limits. For more details, please check-out their website. 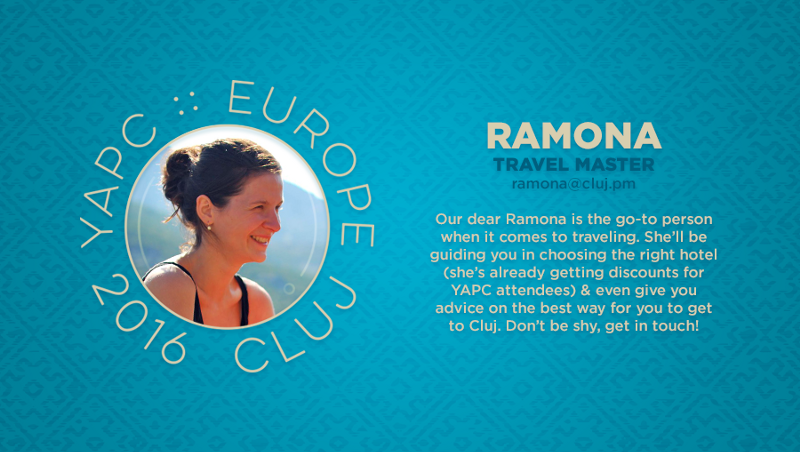 We are so excited to announce our first keynote speakers for the upcoming YAPC::EUROPE conference, the 2016 edition, held in Cluj-Napoca. 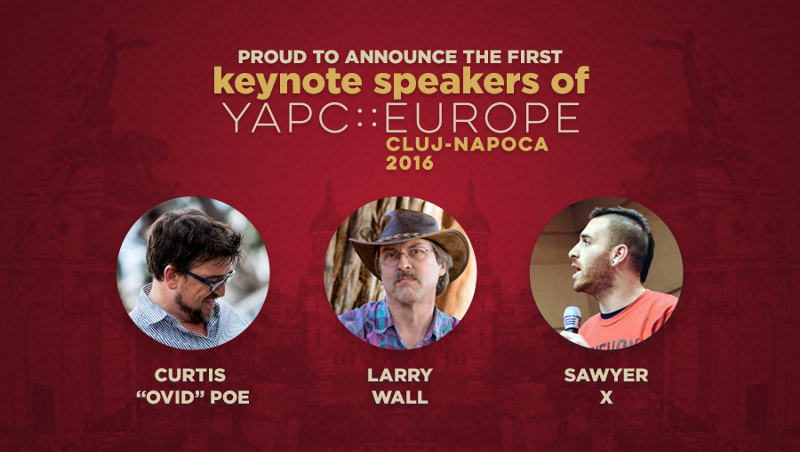 Cluj will be welcoming three amazing people & Perl experts: Larry Wall, Curtis ‘Ovid’ Poe && Sawyer X.
Larry Wall needs no introduction. It used to be all his fault, but now it’s a lot of people’s fault, and that’s also his fault. Curtis “Ovid” Poe is a well-known Perl expert, author of the popular book “Beginning Perl”, and sits on the board of directors of the Perl Foundation. He’s one of the principals with All Around The World , a consulting firm specializing in Perl training and development. AATW refactors legacy systems, adds features to existing systems, and builds new systems. We are delighted to have them all on stage && are looking forward to hearing them speak about this language && community we all love, Perl. 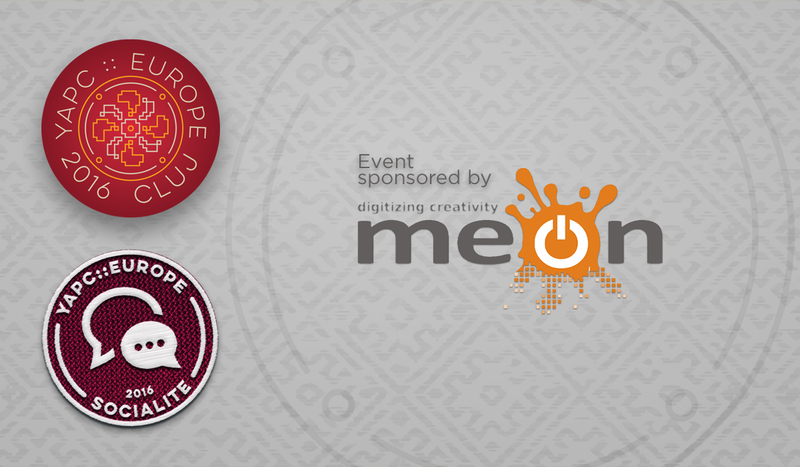 We would like to give a shout out to our amazing sponsors for making YAPC::EUROPE 2016 possible. 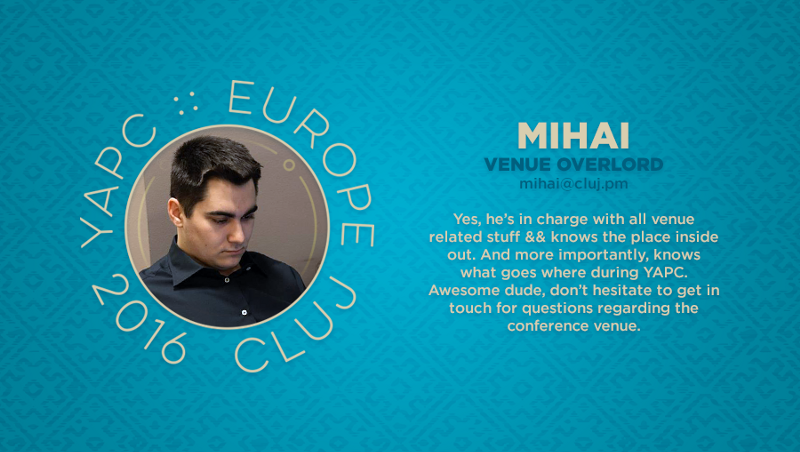 In charge with the conference habitat, Sami will be in charge of creating nice areas for all attendees to enjoy, while at ‪#‎yapceu2016‬. Our ‪#‎VenueArtist‬ will provide us a chill-out area, a working area with tables, chairs & extension cords, and maybe even a small gaming area! And, of course, making sure the exhibitor && sponsor booths are in place! You’re in good hands! Mondays are fun when you’re planning a ‪Perl‬ conference like‪ #‎yapceu2016. 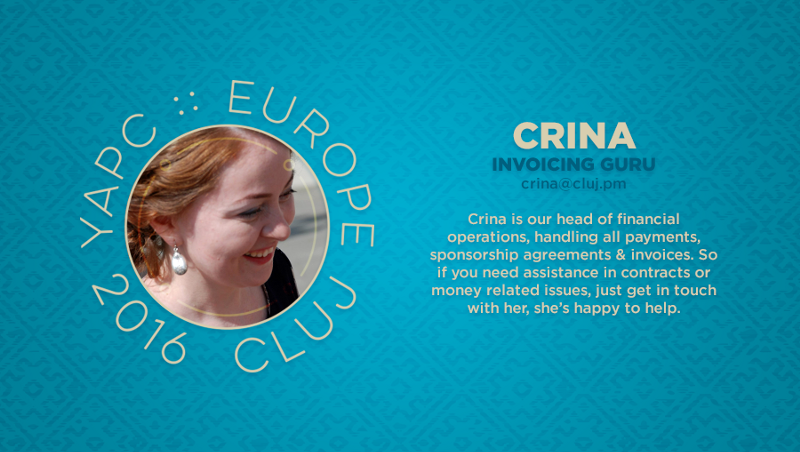 Plus that today we meet Crina, our head of ‪financial ‬operations. Cool, huh? #‎MediaWizard‬ && ‪photography‬ aficionado, our dear Silvia is taking care of media partnerships && making sure we’ll have the most amazing photos. Can’t wait to see her in action! She’s amazing && we’re confident we’ll have a fun ‪#‎PhotoBooth‬ set up at the venue! Practice your best angles && see you in Cluj! Lovely day to meet our ‪#‎MediaWizard‬, Bogdan! 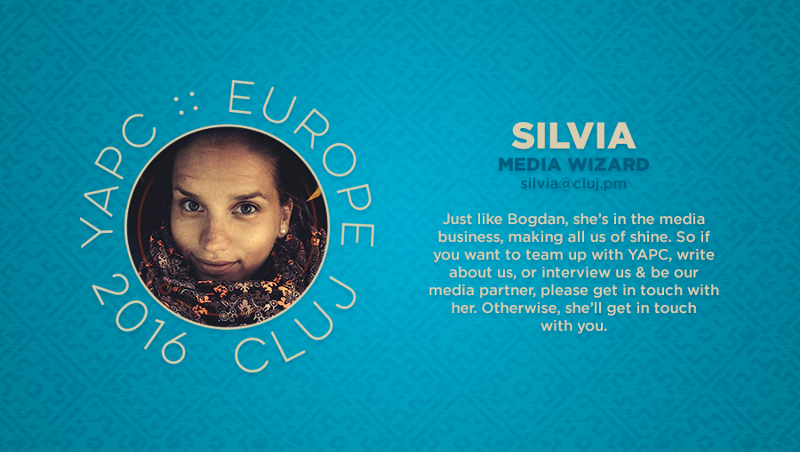 With Bogdan on board, we’re sure the event will get quite the coverage! 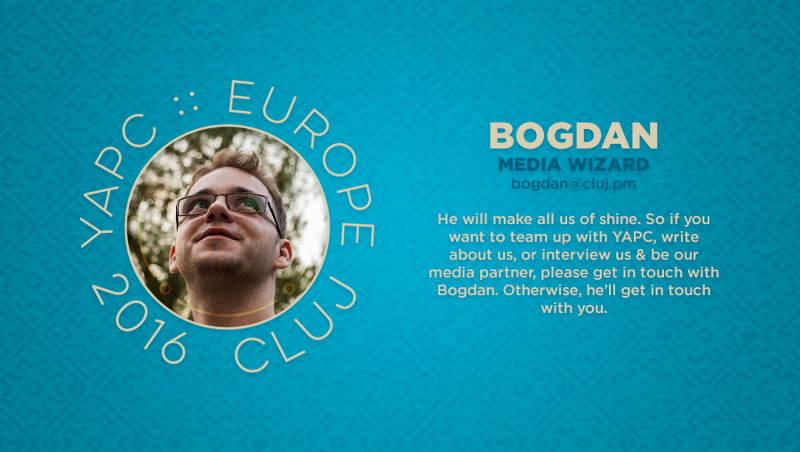 If you’re interested in promoting YAPC::Europe 2016 && team up with us, get in touch with Bogdan! The training day at ‪#‎yapceu2016‬ has a dedicated ‪#‎TrainingOverlord‬, Andra! So far we’ve got 1 training course, the ‪#‎Dancer‬ training brought to us by Dave Cross. Rates && sign up form coming soon. Looking for the best way to get to ‪Cluj‬, or a ‪‎hotel‬ to stay at, as close to the venue as possible, or maybe looking for an apartment or hostel? Ask our dear ‪#‎TravelMaster‬, Ramona. Getting to ‪#‎yapceu2016‬ has never been easier! Don’t be shy, get in touch for any travel advice. A new week, a new sponsor joins the growing list of YAPC::Europe supporters. So who are our Deal-Makers? 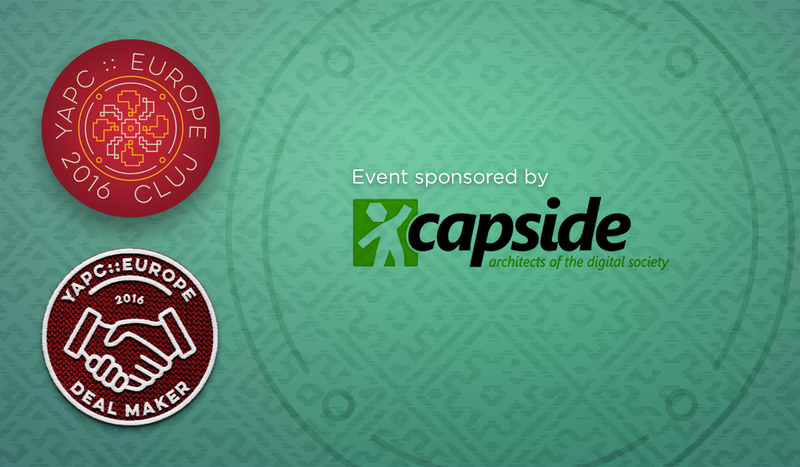 None other than CAPSiDE, a great company located in sunny Spain. We’re looking forward to meet these amazing architects of the digital society at YAPC::Europe, in August. And don’t forget to thank them for their involvement, when you see them around. We sure want to thank them now for joining the amazing journey YAPC::Europe is. If you’d like to contribute to the future development of Perl & Perl dedicated events, you can become a sponsor yourself. We know how much you, the ‪#‎yapceu‬ gala dinner, so we introduce Georgiana, who’ll take care of the ‪#‎yapceu2016‬ party. 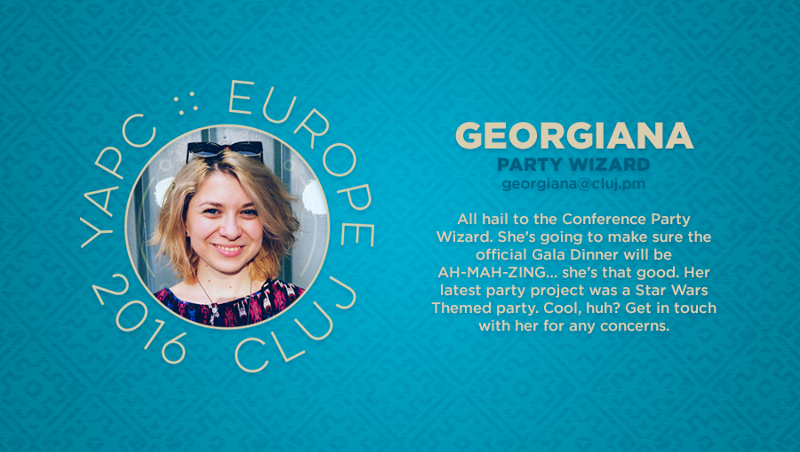 Geo is our ‪#‎PartyWizard‬, we’re sure she’s going to pick an amazing location, arrange some exquisite menus, music and, more importantly, provide both entertainment && networking opportunities for all attendees.‪#‎TeamYAPCEU2016‬. Are you on the attendees list yet? 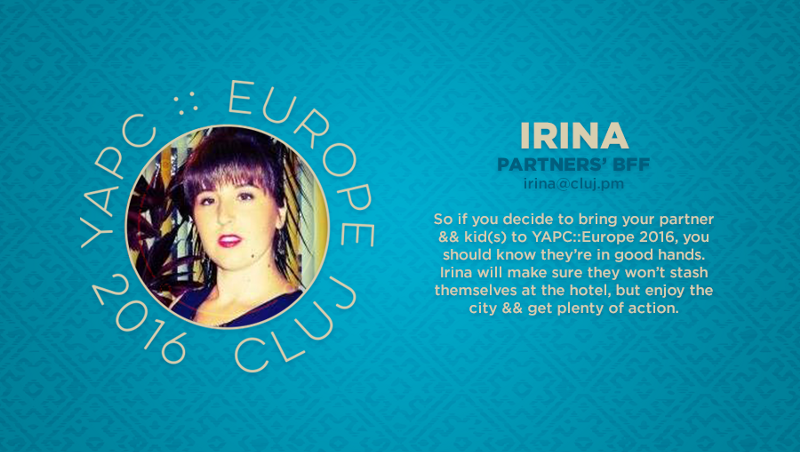 Today we’re featuring Irina, our‪#‎partnersBFF‬. If you have any question, or suggestions, just get in touch with Irina, she’ll be happy to help. Have you met Liana, our ‪#‎speakersBFF‬? Can’t believe we’re almost done with the first call for speakers! As we’re announcing the 1st batch of accepted talks by June 1st, you’ve got 5 more days to submit your paper, if you want to be announced as a #yapceu2016 speaker really soon. If you’ve run out of ideas, check out this post. It might help in finding a right topic. Share your experience, amaze us with incredible ideas && practices. We want to have our minds blown about what we had never thought could be possible with Perl. More on the website: http://act.yapc.eu/ye2016 Hope to see your talk in the submission list! Team introduction goes on with Mihai, our conference venue manager. He’s a great guy, we’re going to be in good hands. So what does a #VenueOverlord do? Well, he’s in charge with all venue related stuff & knows the place inside out. And, more importantly, knows what goes where at YAPC, coordinating all on-site activities. Don’t hesitate to get in touch for any venue related questions. Every great conference has a great team behind it. We want you to meet ours , so today we’re introducing Alexandra, ‪#‎sponsorsBFF‬. Here comes the announcement of the very first YAPC::Europe 2016 Training. It’s official, Dave Cross is going to teach Modern Web Development with Perl and Dancer. It’ll be a hands-on course and over a day we’ll build a complete (and, hopefully) useful little web application using a number of modern web technologies. The back-end will (of course) be Perl (specifically Dancer2) but we’ll also be using Bootstrap, jQuery, Mustache and more. As soon as we have more details & you’ll be able to book your seat, we are publishing everything to the YAPC::Europe 2016 website, but there are some fabulous plans being discussed. Dave Cross is already really excited about the content of his training & we think it’s gonna be awesome. I’m really pleased with how it’s shaping up. I think you’ll enjoy it too. So when you’re planning your trip to Cluj-Napoca, please consider travelling a day early and coming to the training. It’ll be a lot of fun. We are really proud to announce a new sponsor, joining us as Socialites. Ladies and gentlemen, meet Meon. Meon are headquartered in Vienna, Austria, and their services include e-commerce, web apps, data processing & Linux server management & hosting. You will sure learn more about them at YAPC::Europe 2016. Their support is highly appreciated & we want to publicly thank them for joining this journey. So thank you, guys! You rock! Here’s a little weekend treat. We’re excited to announce that the conference info section of the ‪#‎yapceu2016‬ website has just been made public. Conference info means: About, Speakers [TBA], Talks [# of talks], Schedule [TBA], Sponsors, Venue, Organizers && Contact. Explore all conference info we have so far http://bit.ly/yapceu2016-info & don’t forget to register, submit a talk, or check out the sponsorship opportunities. 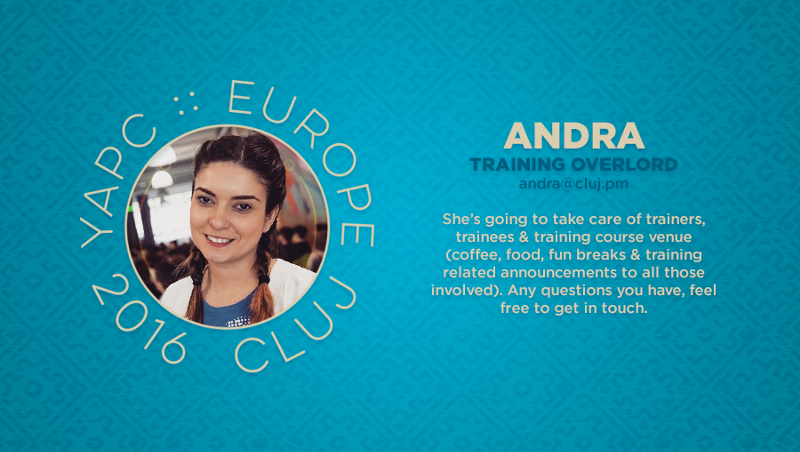 Oh, and if you don’t know how to approach your manager about coming to Cluj for YAPC::Europe 2016, check out the “Convince Your Bo$$” presentation we prepared for you. Do I need a visa in order to come to Romania? Citizens of the European Union or from the European Economic Area (EEA) can enter Romania at any border checkpoint where they submit must a valid identity document — passport or another identity document acknowledged by the Romanian State. EU/EEA citizens may enter and stay in the territory of Romania in keeping with the right of free movement and residence granted under the Romanian legislation, according to European provisions. For a stay in Romania longer than 90 days, a registration certificate has to be obtained from the Romanian Immigration Office. Citizens of other states (states not in the EU/EEA) need an entry visa. Please consult the list of states whose citizens, holders of simple passports, are required a visa upon entry on the Romanian territory. Please consult the list of states whose citizens, holders of simple passports, are not required a visa to travel to Romania. The regime applicable to the holders of diplomatic and service passports, official passports or seamen’s books. - the Republic of Moldova; - the Former Yugoslav Republic of Macedonia; - the Republic of Serbia, except for the passports issued by the Serbian Coordination Division (in Serbian: Koordinaciona uprava); the Republic of Montenegro (the non-biometric passports issued by this state are no longer valid). ​The holders of Schengen visas with two or multiple entries, national visas or residence permits issued by Schengen Member States. Attention! The number of entries as well as the right of stay established as per the Schengen visas must not have been exhausted. The right of stay on the territory of Romania shall not exceed the right of stay granted as per the visas/residence permits issued by the Schengen Member States. The holders of permanent residence permits issued by the UK or Ireland. The right of stay on the territory of Romania shall not exceed the right of stay granted as per such residence permits. The holders of visas or residence permits issued by Bulgaria, Cyprus or Croatia. Attention! The number of entries as well as the right of stay established as per such visas must not have been exhausted. The right of stay on the territory of Romania shall not exceed the right of stay granted as per such visas/residence permits. The holders of small border traffic permits issued by Romanian authorities, whenever they exercise their right to circulation as per the small border traffic regime. 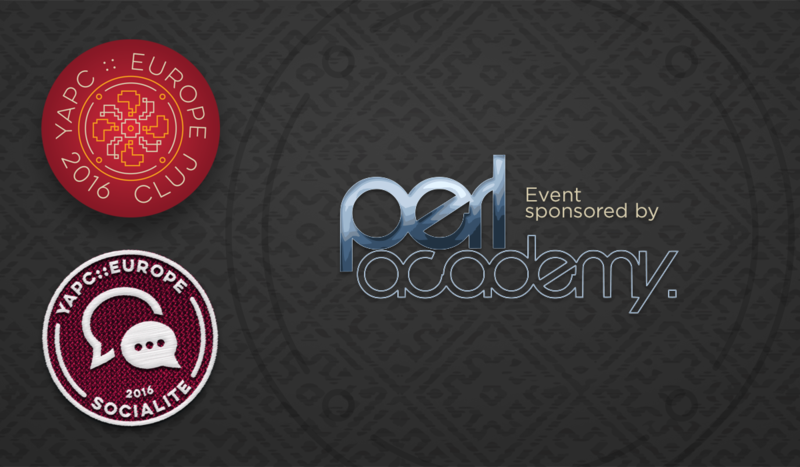 We are proud to introduce a new sponsor of YAPC::Europe 2016: Perl Academy, joining us as Socialites. We truly appreciate their support and commitment to the future of Perl. Don’t forget to thank them next time you see them at a tech event. 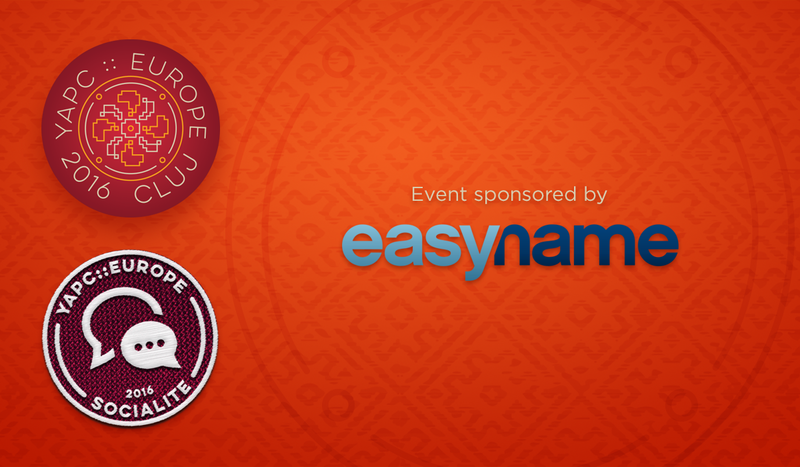 Today’s superstar is easyname, a hosting company located in Slovakia. They’ve made the decision of sponsoring YAPC::Europe 2016 as Socialites && we want to thank them for contributing to the growth of the Perl ecosystem. 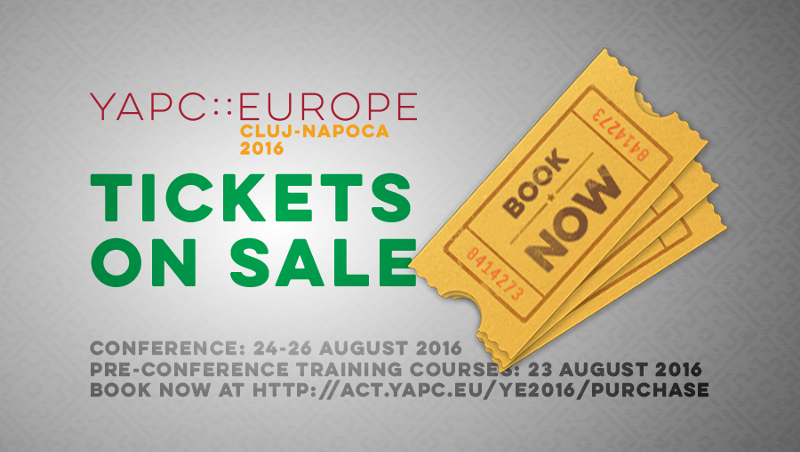 If you didn’t pre-register for the conference just yet, all you need to do is go to http://act.yapc.eu/ye2016 && do so. They’re going to have an amazing booth, so don’t forget to say hi && thank them for the great work they’re doing, if you’re in Cluj, attending the conference. 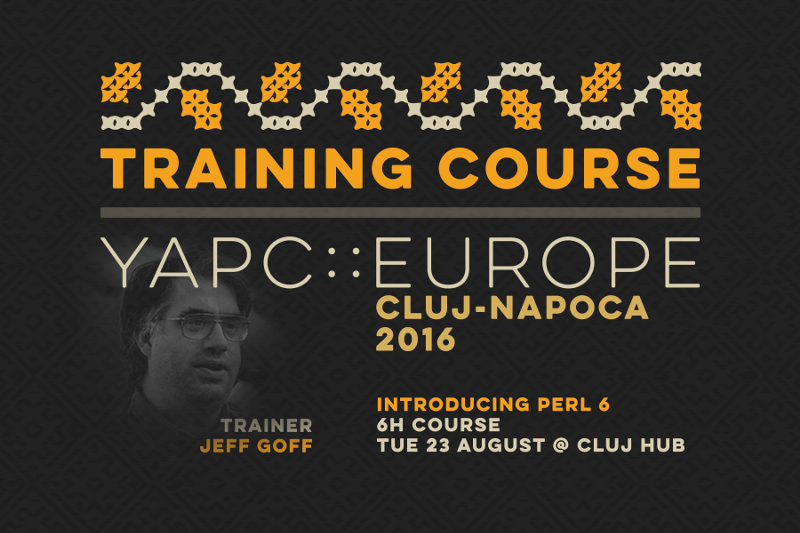 Perl + Transylvania= YAPC::EUROPE 2016. Let’s team up! This is our official Call For Partners, as it is our pleasure to invite you to join us as partners, either sponsors or exhibitors, at the very first Transylvanian edition of YAPC::Europe. All the magic will happen on 24–26 August, 2016 in Cluj-Napoca, at “Iuliu Hațieganu” University of Medicine & Pharmacy, located at 23, Gh. Marinescu street, when our city will officially become the Capital of Perl for 3 days. Therefore, we offer 5 sponsorship && exhibition opportunities, as follows: Socialite, Show-Off, Deal-Maker, Rockstar && All-star. By the way, besides the 5 levels, there are some extra benefits that can be customized depending on your needs & wishes. We already have 59 registrations (from 20 countries), 17 talk submissions && a couple of companies that already committed to sponsoring the event. Exposure opportunities are great, given that, every year, the conference manages to attract around 300–400 Perl professionals. Without further ado, we invite you to check out our full presentation && choose the package that best suits your needs. The conference features 3 full days of program, plus a pre-conference training the day before the conference. Besides the obvious technical shenanigans, 4 days of intense Perl (3 days of conference && 1 day of trainings), evenings will be filled with social activities to facilitate networking between all conference attendees, meet up with friends & make the most out of the amazing experience YAPC::EUROPE 2016 is . Ready for the real Transylvanian experience? · Because it’s one of the best ways for you to create & nurture your relationship with the Perl community. Reach an engaged and international audience. · Because it’s a great way to show off. Yes, with the right sponsorship level you get to have your own talk slot & make your Perl-based company world-famous. · Lure all the community to your booth & give away all that swag your marketing team has created. Everybody there will go home with something special from you, their potential service provider or employer. · Spot real talent. YAPC brings together all the best engineers, all those CPAN authors & hard-core developers you look up to & want to have in your team. We’re looking for partners, companies like yours, so together we can make YAPC::EUROPE one of the most sought-after technical event in Europe & not only. It’s a wonderful programming language with a wonderful community, let’s make it THE tech event everybody’s looking forward to. 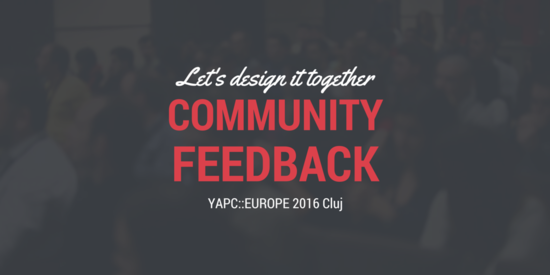 We want to see our partners as happy as possible, feel free to get in touch for any suggestions and ideas, just email us at yapc@cluj.pm. Cheers && hope to see you all in Cluj-Napoca at the end of August 2016. Call For Speakers is ON! Ready to rock YAPC::EUROPE 2016? Big day is here, YAPC::EUROPE is accepting talks as of today. We already had 6 brave speakers submitting their talks, within minutes from launching the website. Now that’s what we call enthusiasm. Well done guys, you deserve a big round of applause! We made 5 talk slots available for this years’ conference, as follows: the beloved lightning talks, 15 min. slots, 30 min. slots, 60 min. slots && 90 min. slots. So come on, share your experience, amaze us with incredible ideas && practices. We want to have our minds blown about what we had never thought could be possible with Perl. We are looking for talks focused on all parts of Perl. Deadline to submit talks: July 15th, 2016. We’re accepting proposals as we go, so the first batches of accepted talks have been already announced. What do you think? Worth thinking about it, right? 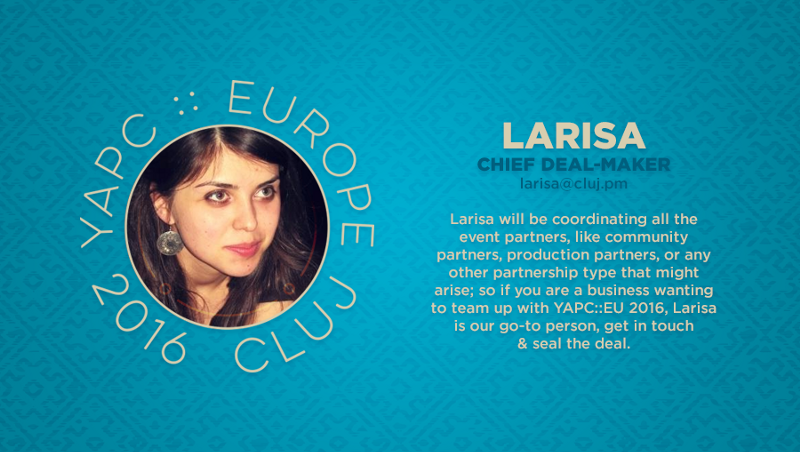 For any extra details, we are happy to help at yapc@cluj.pm. Vote your ❤ Keynote Speaker for YAPC:EUROPE 2016! Last week, during our closing notes at Cluj.PM Event #9, we have officially launched the CALL FOR VOLUNTEERS for the upcoming YAPC::Europe. 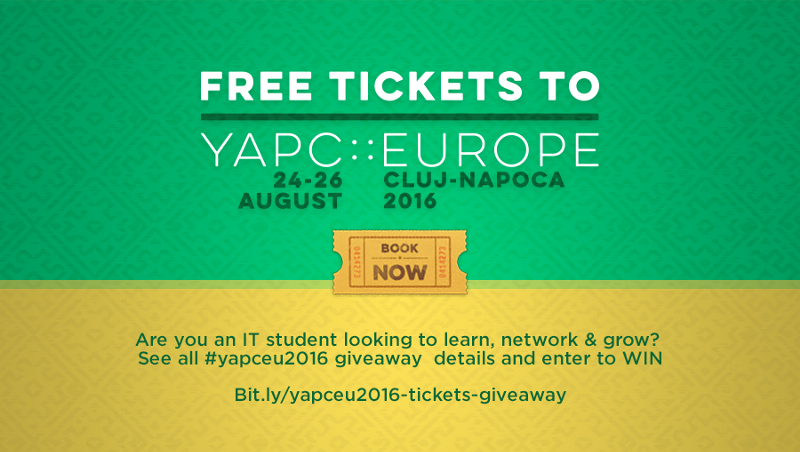 You all know by now it’s being held in Cluj-Napoca, on August 24–26, 2016. 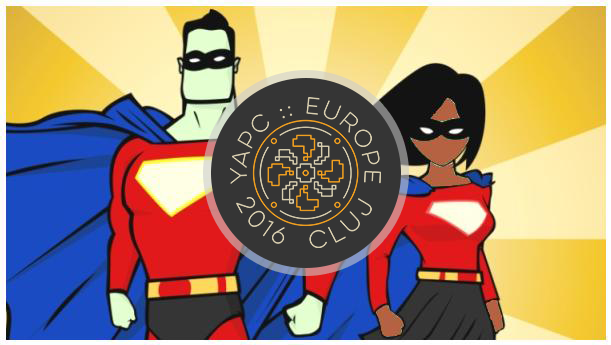 Long story short, if you’d like to sign up as a volunteer, join the list & let us know what’s your superpower & what you’d like to do as a member of the #yapceu2016 crew. Whether it’s marketing & PR, catering, Wi-fi, conference dinner organization, or onsite volunteering, sign up to join. We’re aiming for a pretty large team, as a lot of work needs to be done pre, during & post event..
Let’s create our #dreamteam & rock #yapceu2016! The much awaited moment is here! We’re super, super excited to announce everybody to SAVE THE DATE! It’s official, YAPC::EUROPE 2016 will be held on August 24–26th, 2016, in Transylvania! We’ve also arranged a really cool & central location, namely the University of Medicine and Pharmacy “Iuliu Hațieganu” Cluj-Napoca: http://bit.ly/yapc-umf-2016 You’ll be here, right? Stay tuned! European Perl Community, time to get involved! 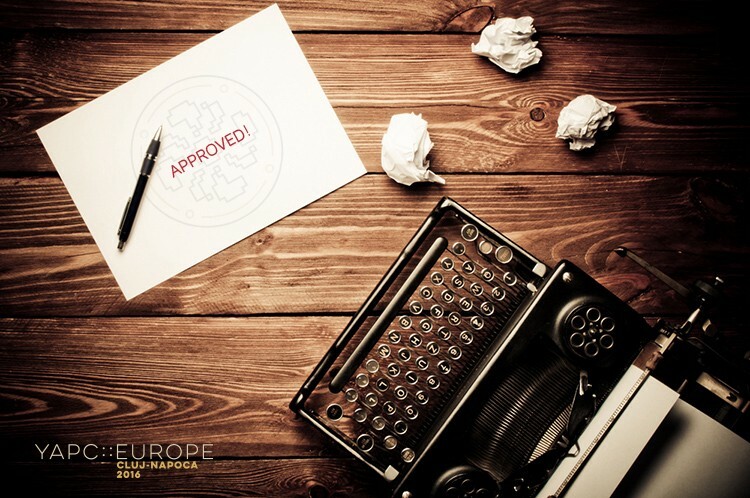 A fine day for getting a head start with the YAPC::EUROPE 2016 organizing tasks, so before doing all the implementation, please help us design the look & feel of the next YAPC edition: http://bit.ly/yapceu2016-design Get involved & spread the word! Major European ‪Perl Conference to be hosted in ‪Cluj in 2016. The following article has been originally posted in Romanian & doesn’t have a translation currently. Conferința YAPC::Europe va fi organizată în premieră pentru România la Cluj, în 2016, iar în orașul de pe Someș sunt așteptate nume sonore din lumea IT-ului, în special a Perl (limbaj de programare — n.red.). Ajunsă la cea de-a 16-a ediție, YAPC::Europe a ajuns la Cluj după ce echipa Cluj.pm a trimis o propunere comisiei de organizare, iar aceasta s-a decis să o accepte și a făcut anunțul la începutul conferinței de anul acesta, de la Granada, Spania. Amalia Aida Pomian, event & community builder la Cluj.pm, a declarat pentru Vocea Transilvaniei că acest eveniment este centrat pe limbajul de programare Perl, însă subiectele abordate sunt dintre cele mai variate, de la UI (user interface — n.red.) la business, antreprenoriat, comunitate și alte limbaje de programare. YAPC::Europe 2016 la Cluj e un succes imens, având în vedere faptul că un astfel de eveniment nu a fost niciodată găzduit de România. La YAPC participa nume sonore din lumea Perl-ului, de exemplu Larry Wall, creatorul acestui limbaj de programare, care a fost guest speaker la ultima editie Cluj.pm. Evenimentul va dura trei zile și va conține workshopuri, cursuri și hackatons, atât înainte cât și după conferință, iar la YAPC::Europa sunt așteptați programatori din toată Europa și aproximativ 60–70 de speakeri. La nivel mondial există YAPC::Europe, YAPC::NA (North America) YAPC::SA (South America), YAPC::Asia, YAPC::Russia și YAPC::Australia. Cluj.pm, comunitatea locală formată în jurul limbajului de programare Perl a fost lansată cu 3 ani în urmă, în martie 2012, și în momentul de față este una dintre cele mai mari comunități tehnice din Cluj-Napoca, însumând aproximativ 200 membri. Perl, limbajul de programare creat de Larry Wall, a luat fiinţă în 1987 și este folosit în mod extensiv de către companii foarte mari”.